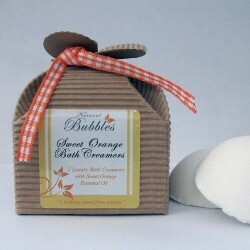 Two luxury handmade creamers made with pure Sweet Orange Essential Oil and lashings of Shea Butter and Cocoa Butter. Sweet Orange has a sweet, fresh and uplifting scent that is rich in vitamins, making it an ideal skin conditioner, whilst Shea Butter moisturises the skin. You will certainly notice the difference after this bath time treat! Sodium Bicarbonate, Citric Acid, Zea Mays Starch, Butyrospermum Parkii (shea butter), Theobroma Cacao (cocoa butter), Citrus Aurantium Dulcis (sweet orange oil), Citral, Limonene, Linalool. Eco friendly packaging. All fully recyclable. They contain no chemicals that can irritate the skin.